NASA's Curiosity rover is about to tap the rocky veins of Mars, which might yield clues to the Red Planet's watery past. Exploring a region not far from where it landed on 6 August, the Curiosity rover has found rocks shot through with veins of light-coloured minerals. Chemical analysis from one of the rover's remote-sensing cameras shows that the veins are hydrated calcium sulphates, possibly gypsum. They probably formed when water flowed through fractures in the bedrock and left dissolved material behind behind. The find takes NASA's mantra "follow the water" to a whole new level. "The exciting thing about precipitated minerals is that we know something dissolved rock somewhere else on the planet and ions got transported along by a fluid," said project scientist John Grotzinger during a teleconference yesterday. Studying the mineral-laced rocks can give clues to where the water came from and to environmental conditions when the veins formed. The team will use the rover's drill for the first time on a veined outcrop named John Klein, an homage to a former project worker who died in 2011. The drill can bite about 5 centimetres into Martian rock, collect pulverised samples and deliver material to other onboard instruments for analysis. "What we are hoping to do is get a sense of the mineralogy - how many aqueous mineral phases are present, the isotope ratios, and even a chance to look for organics," Grotzinger said. Although initially thought too soft to preserve fossils, previous work showed that gypsum on Earth can hold traces of ancient carbon-based life. 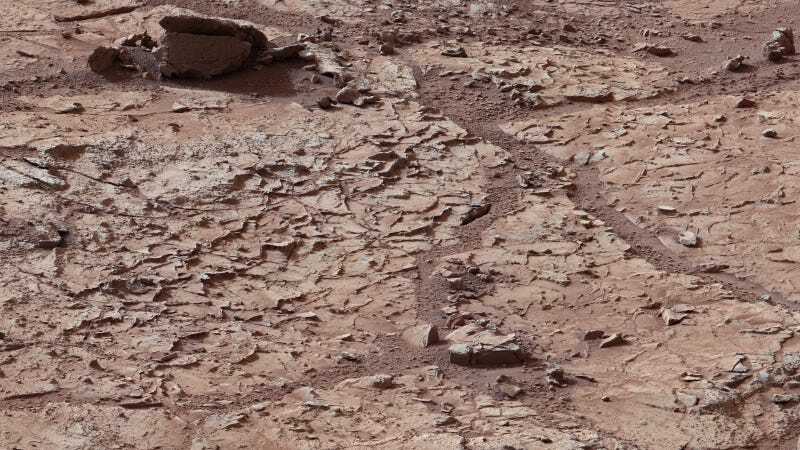 Elsewhere at the site - a shallow depression dubbed Yellowknife Bay - the rover has spotted rocks studded with rounded features called spherules, which also tell of fluids at work. "We are feeling confident these are sedimentary concretions [rocks formed as sediments washed from afar become cemented together]," Grotzinger said. "Put that together with the veins, and basically these rocks were saturated with water." Another outcrop at the site shows a texture called cross-bedding, which resembles stacked layers of rock. These features on Earth are associated with water pushing small dunes of sediments along a stream bed. "There's a real trend that's emerging here on our tour," Grotzinger said. The team won't be ready to drill for a few weeks yet, as they continue to take samples with other instruments and then drive the rover to the John Klein outcrop. "It takes a fairly extended period of time because drilling is the most significant engineering thing we've done since landing," said rover project manager Richard Cook. Team members have also been examining and recording the great diversity of rock types at Yellowknife Bay, some of which may also become targets for drilling. "It's safe to say scientists have been led into the candy store," Cook said. "I'm really excited about the next few weeks."